For floor finishers who prefer to cut their own sheets we offer premium silicon carbide E weight paper in rolls 8" wide by 50 yards long. All of our products are Made in USA from the finest quality materials. The prices below are per one roll. 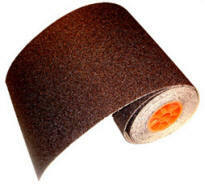 8" x 50 yd rolls are normally stocked except 24, 40, 50, and 120 grit are stocked less than the other more popular grits. E weight paper.